Here were have a finely dressed old gentleman together with his small Spaniel sitting on a chair beside him. The dark wood chair contrasts nicely with the lighter coat of the dog. With limited information there are several things which can help us to estimate the date this photograph was taken. 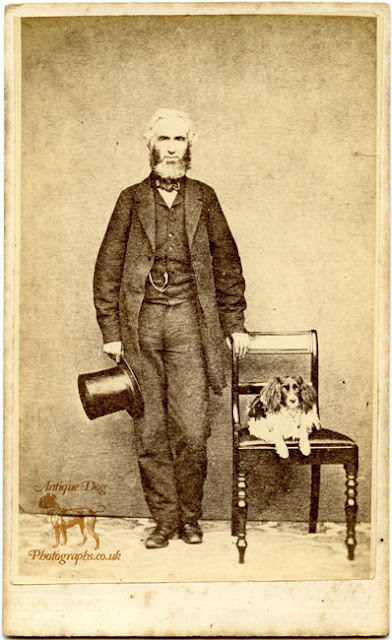 The simple props & backdrop as well as the thin cardstock the photograph is mounted on both point to the photograph having been taken in the early 1870s. The photographer is William Elliot Irving. 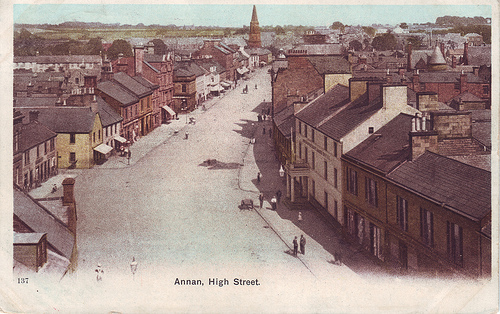 He opperated his studio in Poplar Place, The High Street, Annan in Dumfries, Scotland between 1874 and 1889. William was born in Annan in 1837, the second son of John the Shoemaker (born 1804) and Margaret (born abt 1799). William had an elder brother called Archibold who emigrated to Canada to become a farmer. Archibold and his wife Jennett went on to have a large family (nine children by 1881!) 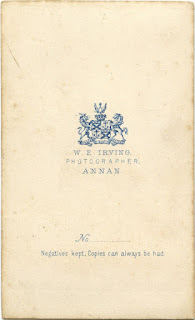 In comparison it would seem William never married and while working as a Photographer was still living with his parents aged 44, in 1881 along with his sister Jemina Sarah Irving who was working as the family housekeeper.